When imagining the Christmas season in Britain, scenes of Victorian period sleigh rides, Ebenezer Scrooge, and Ghosts of Christmas probably dance through your head. But the Texas Early Music Project will celebrate wonderful earlier Christmas traditions in Britannia with a sequence of music from the late Medieval period through the 19th century. From haunting Medieval carols and English psalm-tunes to traditional Irish dances and Celtic lullabies, TEMP puts its unique stamp on these beautiful and joyful selections with innovative arrangements for solo voices, small chorus, harps, violin, flute, and mandolin. Among the Medieval pieces on the concert, TEMP will feature the well-loved "Ther is no rose of swych virtu" and also a lesser-known gem "Lullay, lullay: Als I lay on Yoolis night” with Scottish provenance, (although its source is from Cambridge University), and a hauntingly beautiful melody and story. The Christ-child, as a baby, asks his mother why she doesn’t sing to him as she rocks him and why she doesn’t tell him what his life will be like when he is older. Her response is that she knows very little about him except what Gabriel told her. The dialogue is bookended by a narrator who relays what she saw on that Yule night. The Renaissance portion of the concert will feature a rousing psalm-tune, "While shepherds watched their flocks by night," the 16th century predecessor of Handel’s popular setting, as well as the very popular "Good people all, this Christmastime" ("The Wexford Carol"), arranged for solo voice, strings, and flute. The English traditional music and Celtic music will include a few favorites from past years, such as "Baloloo my lammie," and "Ye Sons of Men." Newly arranged pieces include a lively instrumental by the 17th century Irish harpist Turlough O’Carolan, ("The O’Rourkes Christmas") for plucked and bowed strings and an Irish traditional song, "The seven rejoices of Mary" for solo voices and instruments. Throughout the years, the English traditional song "Drive the cold winter away" maintained its popularity and will be featured for the first time in a TEMP concert. TEMP is pleased that Abby Green, a specialist in Gaelic songs, will be joining as a soloist and ensemble member, and TEMP again is proud to feature nationally acclaimed historical harpists, Therese Honey and Becky Baxter. Featured soloists include Jenifer Thyssen, Stephanie Prewitt, Meredith Ruduski, Abby Green, Cayla Cardiff, Jeffrey Jones Ragona, Daniel Johnson, Paul D’Arcy, and Chaz Nailor. 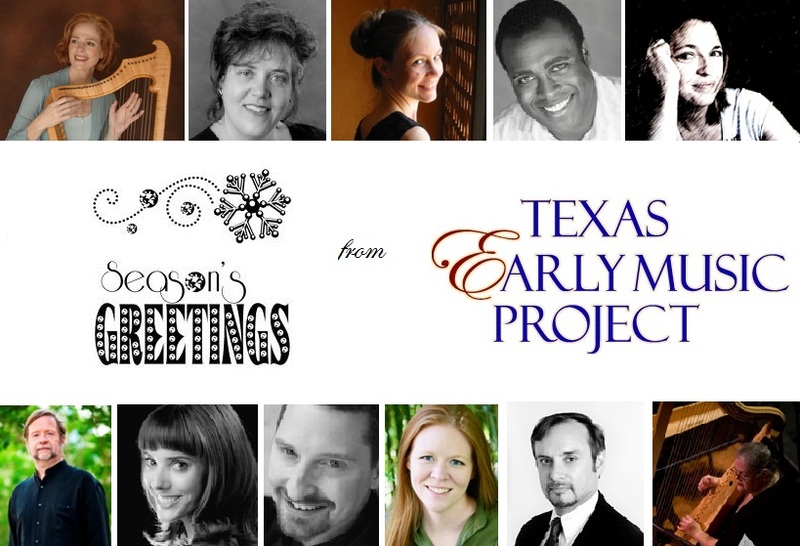 Join Texas Early Music Project for a splendid evening of music encompassing 500 years of festive beauty that will delight your ears and heart! Friday, December 9, 8PM, First English Lutheran Church, 3001 Whitis Ave.
Saturday December 10, 8PM, First English Lutheran Church, 3001 Whitis Ave.
‣ or at the door.